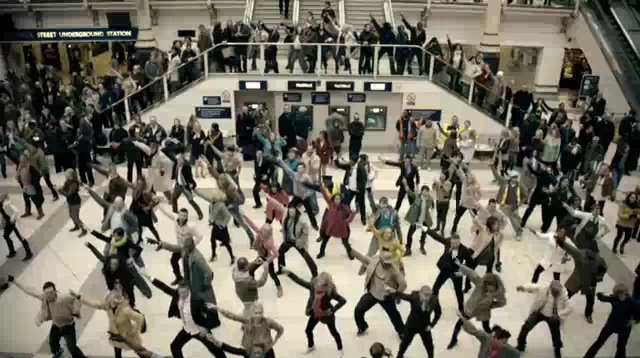 On January 15 at 11AM, a flashmob-style dance broke out in Liverpool station courtesy of T-Mobile. The point of the stunt? To illustrate the fact some things in life are worth sharing and T-mobile can help with that sharing. Simple enough. The work comes from Saatchi $ Saatchi. And yes, before you jump all over Saatchi, they know the flashmob things has been done before. Was the venue/participants branded in anyway? And if so, how? Liverpool Street Station is no stranger to flash mobs - it seems like it is host to one almost every week! What makes this one stand out is the combination of the sheer scale (350+ dancers), the speed of turnaround (48 hours to film, cut and edit the footage) and the offline airing on Channel 4.